Christiane Amanpour returns to CNN Worldwide this spring and will broadcast her signature program, Amanpour, in primetime in Europe and throughout the world in more than 200 countries as the centerpiece of a new CNN International lineup, it was announced today by Tony Maddox, executive vice president and managing director of CNN International. Each weeknight on CNN International, Amanpour will deliver the definitive international news and interview program that CNN’s worldwide audience has come to expect of the preeminent global journalist. 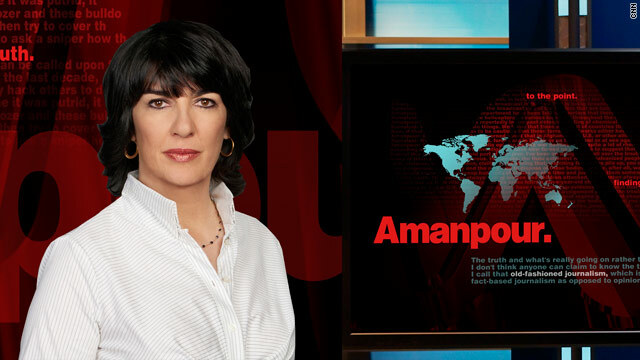 Amanpour will air weekdays at 3 p.m. and replay at 5 p.m. (ET) on CNN International. The half-hour show will air twice during European primetime, providing viewers with an additional opportunity to tune in for a distinct take on the challenging issues facing the world. Liza McGuirk, an award-winning producer who has more than two decades of experience in television journalism both producing and reporting, will be the executive producer of Amanpour. McGuirk will be based in New York along with Amanpour. In the unique relationship announced in December, Amanpour’s primary role is as global affairs anchor for ABC News blazing a trail in international reporting for American viewers, in addition to her new program on CNN International reaching a vast global audience. She will continue her courageous reporting in war-torn countries for all ABC News programs, platforms and online, including her unmatched ability to land major and rare exclusive interviews with world leaders – including last year’s only interviews with Moammar Gadhafi and Hosni Mubarak. As global affairs anchor for ABC News, her ongoing assignments range from the uprisings in the Middle East to Iran’s nuclear program to the Eurozone crisis. Amanpour will also report on new conflicts, natural disasters and humanitarian crises, anchor four primetime specials on ABC and continue Around the World with Christiane Amanpour, her recently launched video series for ABCNews.com and Yahoo News. “I’m thrilled that Christiane’s powerful, utterly original journalistic voice will once again be heard around the world, and I look forward to helping her shape an important program at a time of great global change,” said McGuirk. Amanpour will be at the center of a dynamic new lineup featuring existing programs International Desk, Quest Means Business, Connect the World with Becky Anderson and Piers Morgan Tonight as well as a new weekday news program anchored by CNN’s Isha Sesay, who also appears on Anderson Cooper 360°. With the launch of Amanpour, CNN International is once again offering Europe’s primetime audience a destination program featuring one of the world’s most distinguished journalists. Known for her tough questions and extraordinary depth of knowledge, Amanpour will focus on international stories shaping the news agenda, delivering sharp analysis to an audience of more than 280 million households in more than 200 countries around the world with CNN International. Amanpour and McGuirk have previously collaborated on a number of projects for CNN, including the award-winning 1999 documentary about Iran, Revolutionary Journey. In June 2008 McGuirk launched the Sunday morning news and discussion program Fareed Zakaria: GPS, which was nominated for an Emmy after just months of being on air. Most recently she served as the executive producer of Parker Spitzer. She also worked at CBS News for eight years, including four years producing and writing segments for the late 60 Minutes correspondent Ed Bradley. McGuirk reports to Mike McCarthy, senior vice president of programming for CNN International. Amanpour spent more than 25 years reporting from around the globe for CNN. Most recently, she was CNN’s chief international correspondent and anchored Amanpour on CNN International from September 2009 to April 2010. In the summer of 2010, Amanpour joined ABC News and became host of ABC News’ This Week, where she was the only Sunday morning anchor nominated for an Emmy award. Her body of work has earned nine News and Documentary Emmys, four George Foster Peabody Awards, two George Polk Awards, three duPont-Columbia Awards, the Courage in Journalism Award, an Edward R. Murrow award, an inaugural Television Academy Honor and nine honorary degrees. CNNI’s new European primetime lineup (All times Eastern): 1 p.m. International Desk; 2 p.m. Quest Means Business; 3 p.m. Amanpour; 3:30 p.m. new Isha Sesay-anchored show; 4 p.m. Connect the World with Becky Anderson; 5 p.m. Amanpour (encore); 5:30 p.m. World Sport; 6 p.m. Piers Morgan Tonight.